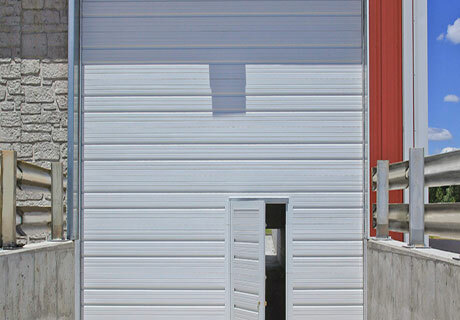 Pass doors, breakaway bottom doors, dock seals, security chain link and screen doors. Pass doors are ideal in applications where space is too limited for the installation of a standard entry door. They conserve energy by allowing building access via a smaller opening versus the entire sectional door, this minimizes wear and tear on the door as well saves electric operator cycles. In inclimate weather, the heat or cold distribution between inside and outside of the building is minimized, conserving additional energy costs. Available On 3724, 3722, 3720, 3718, 3717, 3220, and 3200 models as well as all 520 series and all 524 series. Screen and chain link security doors are a cost-effective way to add security, pest control and ventilation to your facility. 811 11 gauge galvanized steel, chain link security door. Dock seals and shelters provide protection from the weather for your dock and personnel in almost every application. They seal loading docks against changes in the environment that can cost you time and money. Welded aluminum frame with shiplap design affords added strength and durability while providing a weather-tight door seal. Rain cap feature protects door entrance against accumulated water during rain showers. Geared hinge ensures smooth operation and enhances longevity of the pass door. Commercial door closer ensures safe and quiet closure. Continuous boxed channel bottom rail adds additional strength against wind and horizontal deflection. Clopay's Break-Away Bottom Section releases from the track and will swing up to a full 90 degree angle inward or 45 degrees outward, preventing further damage to the door. Bottom section snaps back into place in less than a minute. Inside of section has fiberglass protective panel to prevent damage to the door. Optional inside slide lock provides additional security. Padlock may be applied. Doors must have at least 24" of hi-lift. Not compatible with door drop safety device/bottom brackets.